43010 is a 100 µm double sided tape especially designed for flexographic plate mounting. 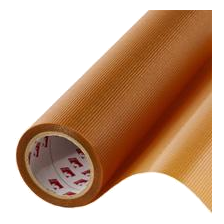 It is based on a transparent e-PVC carrier and features a high tack pressure sensitive rubber adhesive on both sides. 43010 uses a brown corrugated filmic liner. Plates secured with 43010 will not move, even on extensive print runs.